Yesterday was a day of several firsts for me. The first time I ran a cross country race and came away sunburnt. 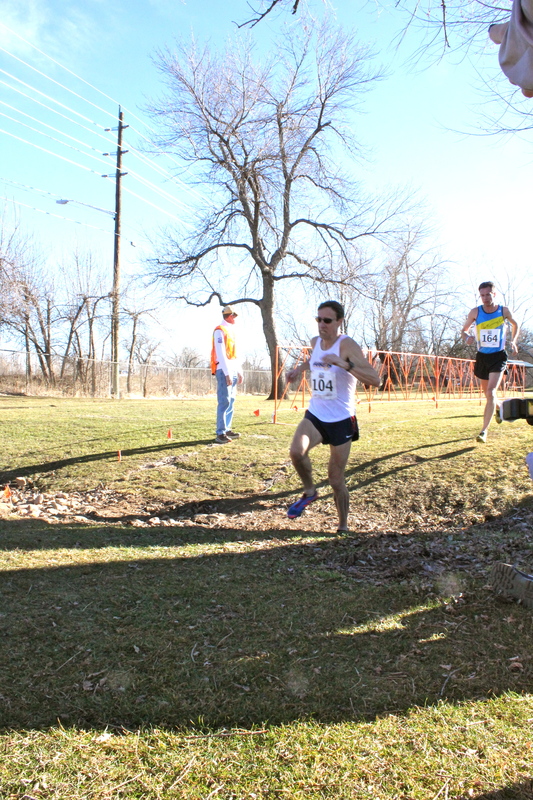 The first time I ran a cross country race in the North American winter in temperatures in the 60s Fahrenheit. 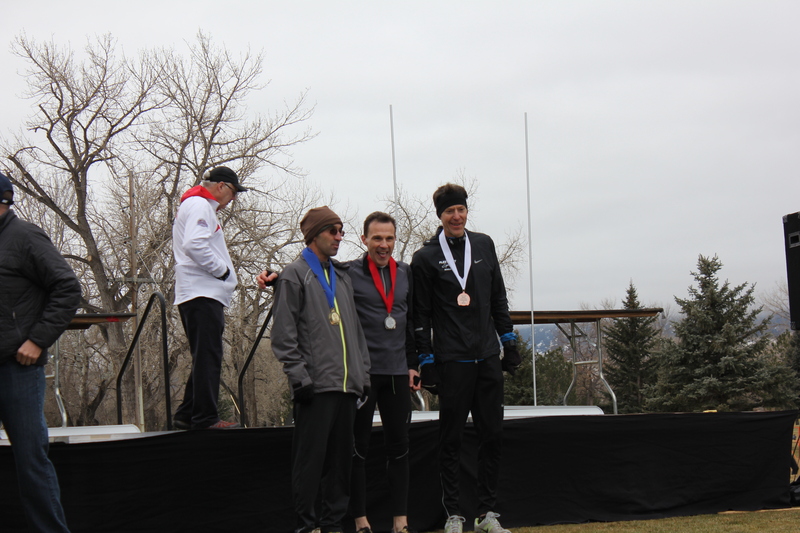 And the first time I shared the 3rd place podium spot with another runner. 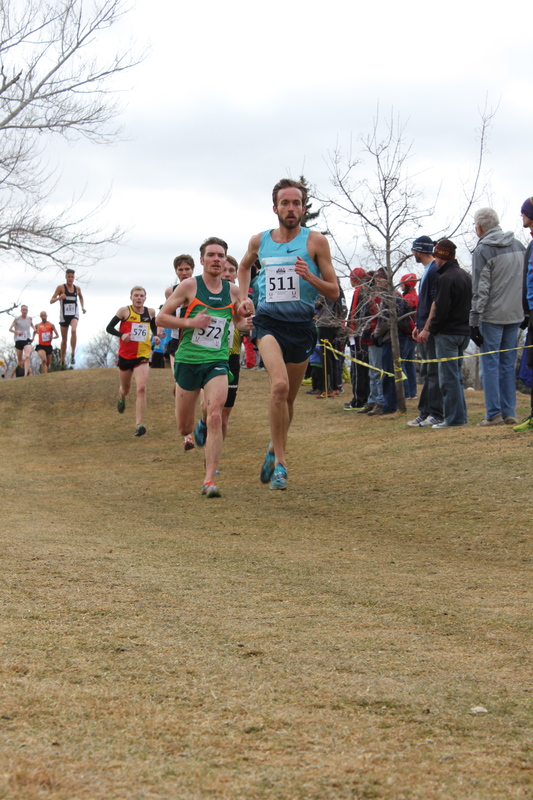 The USATF Cross-Country Championships was the first race on my 2015 list of races. Having raced the exact same race in 2014 and came away, albeit temporarily, with a silver medal for the M45-49 age category, this time I was keen to get a top three placing and avoid receiving a national medal on loan. It also gave Sham and I a great excuse to spend a weekend in Boulder where we have an apartment. The race conditions, bar the altitude, were near perfect. As you can see from the full race coverage on USATF TV. A pancake flat golf course featuring gently twisting turns and carefully cropped turf with just the odd damp patch. The weather was still and warm, good for short shorts and vest. As I warmed up Francis Burdett introduced himself. He hails from Springfield CT. and wore an M50 tag on his back (all masters run in one race and you distinguish your age group competitors by the color coded tags on their backs. I wore a green M45 tag). As a 49 year old this would be the last year in the M45 category. As I did strides I could see my chief age group rivals Simon Guttierez and Rusty Snow, pre-race favorites according to some pundits. Looking back on 2014 I recalled going out hard and mixing it with the early leaders only to find out they were faster than me. 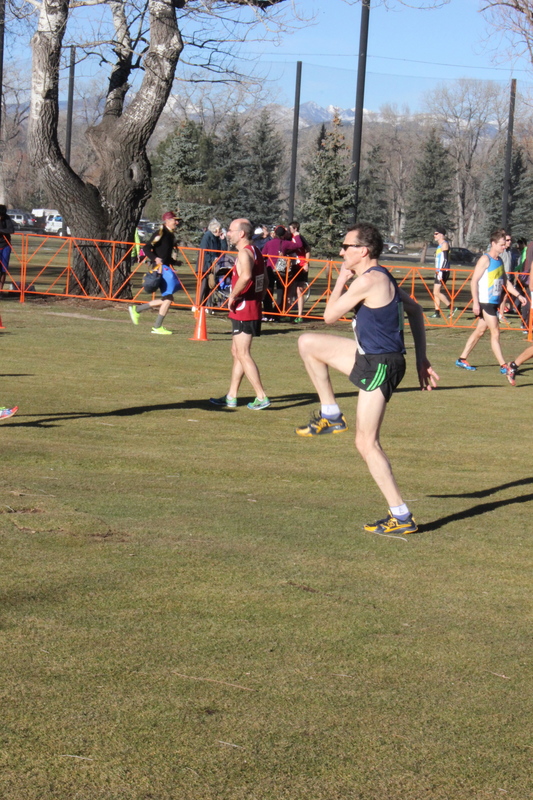 My lap splits, the masters men run four laps of 2k, drifted from an opening 6:15 to almost 7:20. So this time when the gun went I settled into my game plan of aiming for more even splits, circa 7:00 by running half a dozen or so runners further back than my 2014 9th placing. Into the second lap I found myself chasing Burdett and in 3rd place for M45, a good distance behind Guttierez and Snow. Not only was Burdett steady but he was my benchmark – he was in pole position for the M50, a title I would be coverting in 2016 when the race heads to Bend, Oregon. 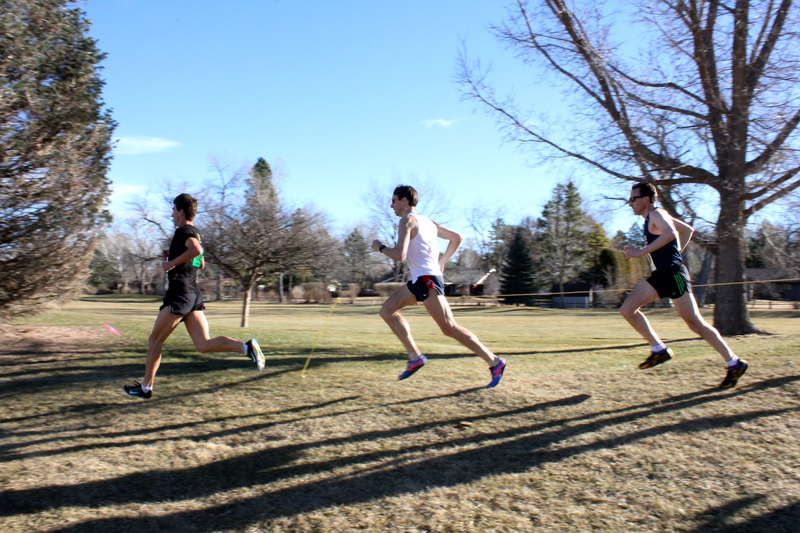 Much of the rest of the race was rather a grind and far from pretty. I had bouts of self doubt but was comforted that I could just about hang onto Burdett and was in 3rd place M45. Burdett did much of the work. I let him tow me around. I only pitched in with the pace work towards the end of each lap (here’s a rare glimpse of me ahead of him) and that was only because he seemed to make a meal of tackling a dry creek. 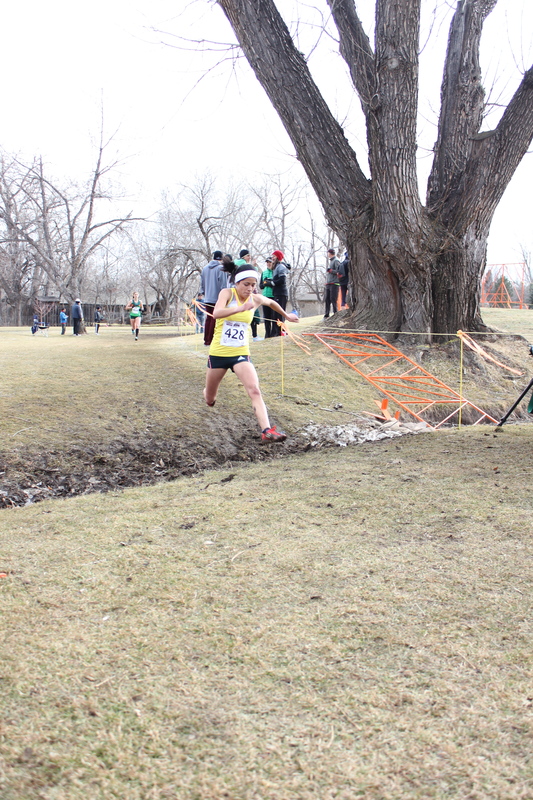 The creek, and some soggy grass 400 metres into each lap, were the things that made this a remotely true cross country course: it was a far cry from the conditions in my last race. Into the last lap it seemed there was just one athlete close behind. With 800m to go I sensed Burdett up the ante. I hung on and hoped that he would make heavy weather of the creek some 4oo metres from the finish. He did and that enabled me to pull alongside and with 200m left to run I found myself sprinting for the line. It was desperate and ugly but I edged in front to take 14th spot. 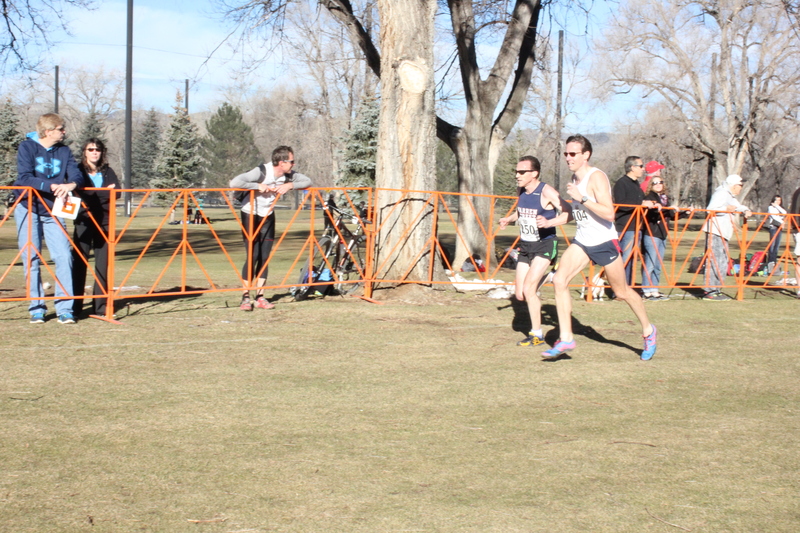 The results had us on identical times of 28:17. Burdett was first M50 and I third M45. Soon after finishing I was contemplating crashing onto the grass but instead found something to lean against while catching my breath. In the finish area I chatted with Burdett and the second M50, Spyros Barres, another East Coaster. We warmed down together, spectating the younger age group races. It turns out Burdett has some track pedigree so had I been competing as an M50 he might have had the legs and motivation to beat me. 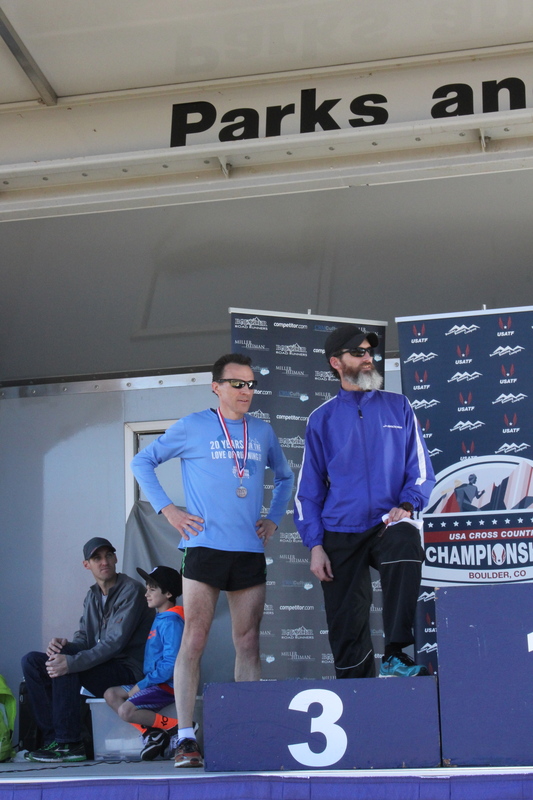 At the awards ceremony USATF added a nice touch – while third place M45 I was ineligible for an award but they called me onto the stage to receive a finisher’s medal and stand on the third place podium with Robert Sweeney. Athletics legend Frank Shorter, who was giving away the prizes, glanced over at me and said, “Well done Simon”. Simon Guttierez was AWOL. I was not sure whether to be flattered or not. 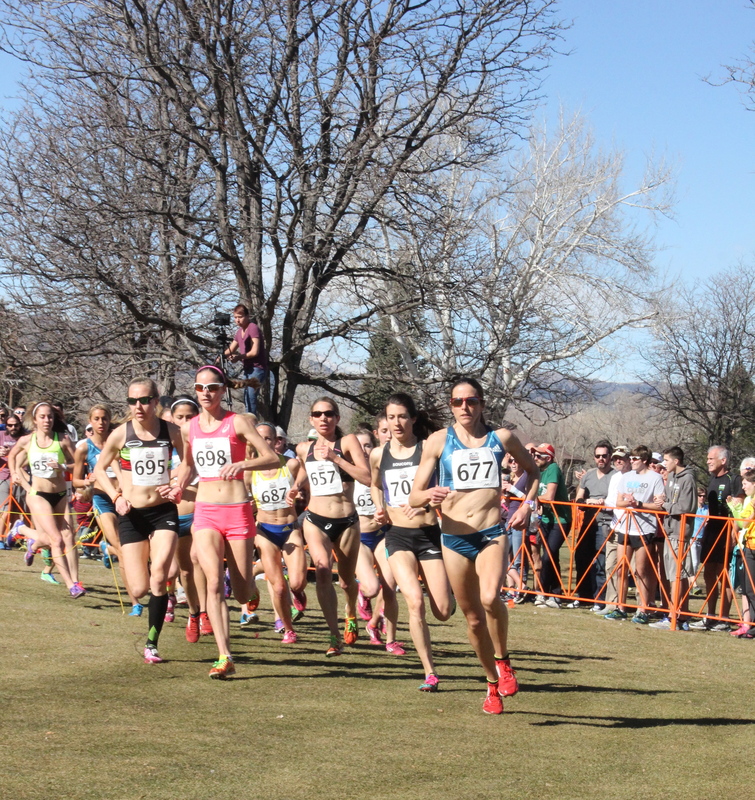 The afternoon ended with the main events – open women and open men, not only championship races but also selection races for Team USA’s runners to compete at the IAAF World Cross Country Championships in China in March. 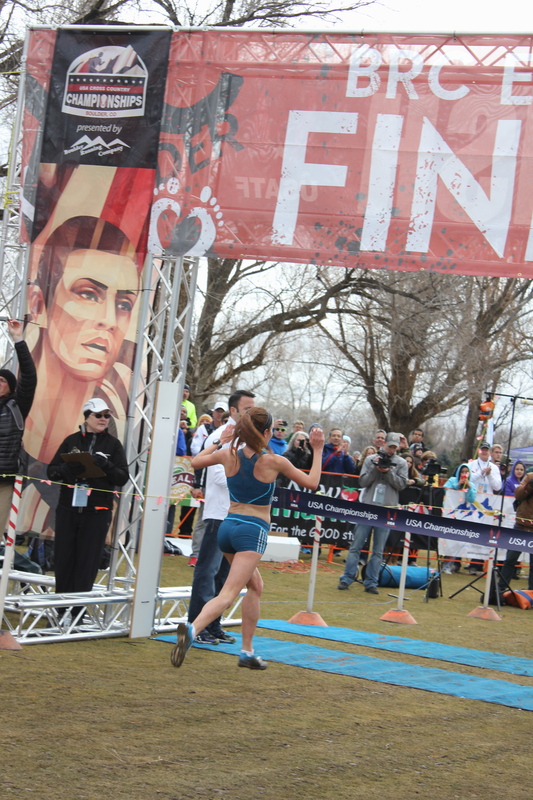 In the women’s race, USATF National Cross Country Club women’s champion, Laura Thweatt, took the first place. 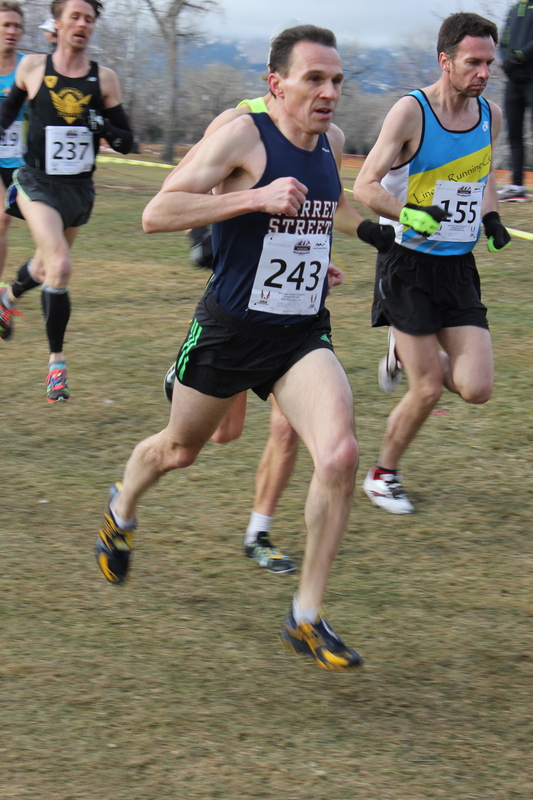 Chris Derrick won the mens’ open for the third consecurive year with ease, in 36:18 , as this video testifies. 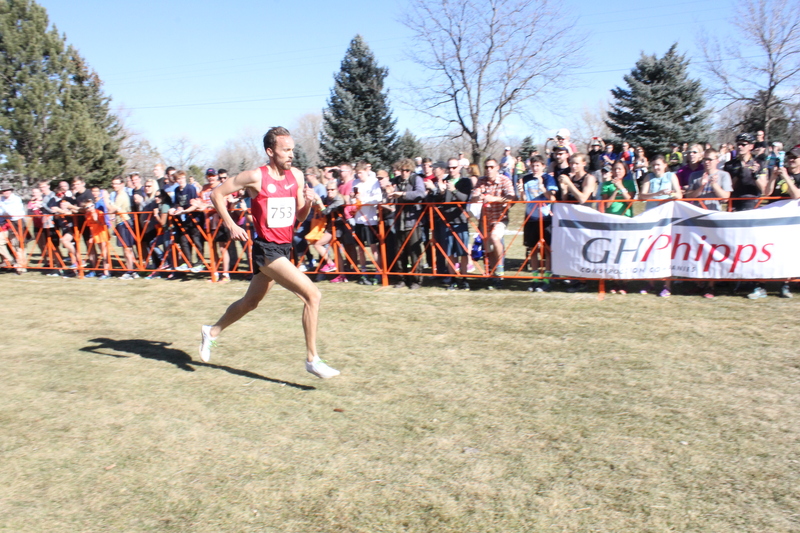 Former Colorado resident, Dathan Ritzenhein, was third after Robert Curtis of Rochester. 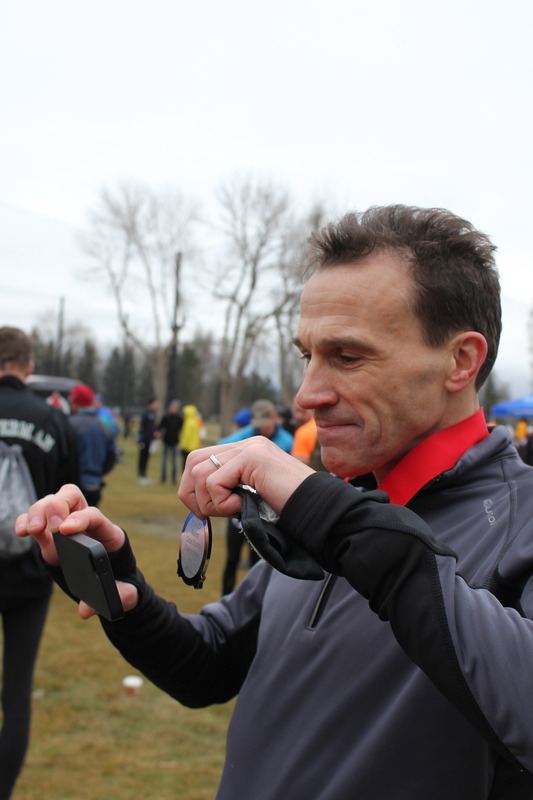 My 28:17 finish time was some 20 seconds slower than 2014. Not bad perhaps given a heavy work week and nagging ITB and ankle issues. 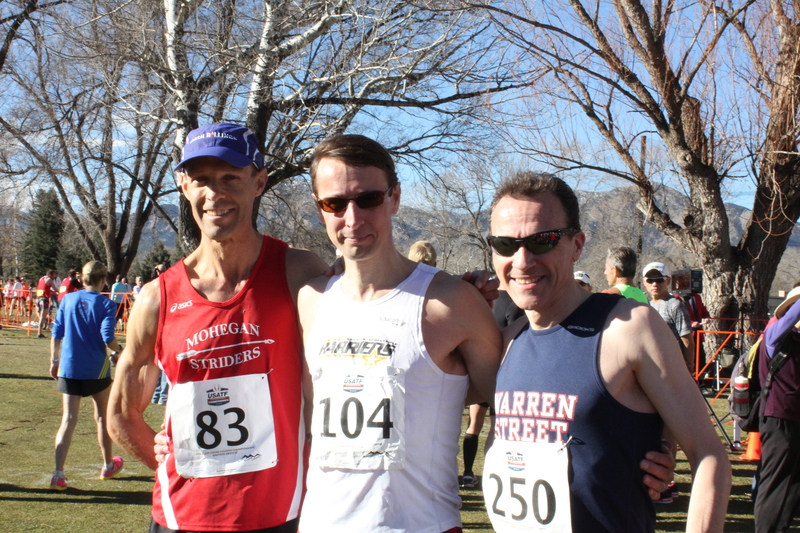 I was also pleased that I was comfortably ahead of Christian Cushing-Murray – in 64th place having placed 3rd in the US Masters Long Distance Runners of the Year 2014 – and had achieved one of my 2015 targets. Next year this race is in Bend, Oregon so maybe Sham and I will get to visit a new state. This morning Sham and I ventured out in what looked like perfect conditions. I ran almost 11 miles on the trails just north of Boulder. A 30-40 mph wind made it a not so easy recovery run!